Shares in Mustang Resources (ASX: MUS) spiked 25% under high volumes on Wednesday after the company announced that 460.4 carats of high-quality rubies had been recovered during the commissioning of its bulk sample mining plant at Montepuez located in Mozambique. This is an outstanding development for the company if one considers the increase in scale that will occur in coming months. The rubies are the first recoveries from 2683 tonnes of initial material processed as part of the commissioning phase. To put this in perspective, the plant will be ramped up to 525 tonnes per day during November 2016. Consequently, the recoveries announced today came from a volume of material equivalent to only five days output once the plant is running at capacity. 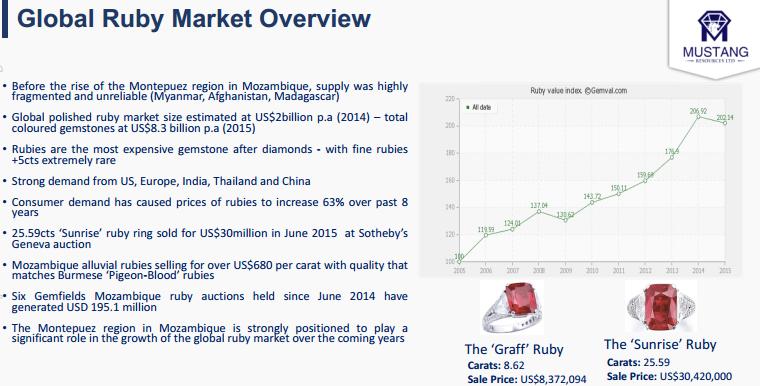 While it is difficult to place a dollar value on rubies recovered, Gemfields plc, which operates in the same vicinity as MUS, has held six rough ruby auctions since 2014 where values have ranged between US$317 and US$688 per carat for medium to high-quality rubies respectively. In terms of quality, an initial assessment of rubies from Mustang’s Alpha deposit conducted in July 2016 confirmed that the company’s rubies were of high quality with some gemstones showing variety of colour, size and clarity. This has provided management with confidence that the rubies being recovered will fetch market-related prices. However, it is impossible to predict commodity prices and potential investors should not only use this data, nor forward-looking production statements when forming the basis for an investment decision. MUS is an early stage exploration company working in a region with sovereign risk and independent financial advice should be sought if considering an investment in this stock. If one were to pick the midpoint of the value range reflected by auctions over the last two years it would imply a price of approximately US$500 per carat. Using this as a guide, a back of the envelope “guesstimate” for 460 carats of rubies is US$230,000. Once again, a note of caution – this is a very rough guide using broad assumptions. Arguably a better perspective can be gained by a preliminary economic study which analyst RB Milestone Group referred to recently when initiating coverage on the stock. 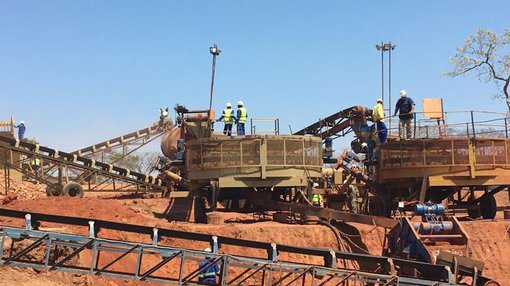 This modelled monthly revenues of US$4.9 million from the recovery of 14,112 carats per month at an assumed average sale price of $350 per carat. This equates to revenues of circa US$60 million a year, nearly AUD$80 million – fairly impressive metrics for a company with a market capitalisation of approximately $10 million. The broker noted that auctions are usually conducted at the end of December and the end of June, suggesting some quantitative guidance regarding the bigger picture may be available in early 2017. Given the seemingly substantial discount to fair value, potential investors could take a lead from Baker Young analyst Dirk van Dissel. When he initiated coverage of the stock in June he said, “On the view that Mustang will achieve exploration and bulk sampling success (which as indicated today, they have) we value the company at 19 cents per share using a weighted discounted cash flow of bulk sampling/future mining operations”. Postulating various production scenarios, van Dissel said, “It is entirely foreseeable that by the end of the year Mustang could have mined enough ruby bearing dirt to assemble a 50,000 to 100,000 carat parcel that could receive at auction tens of millions of dollars”. His target price is broadly in line with the company’s 12 month high of 21.5 cents which interestingly was struck at a time when there was far less certainty surrounding the stock, suggesting that in the absence of regular recent news flow, it may have slipped off the radar. While a highly speculative stock, this is as good an entry point as has been available over the last 12 months, at a time when there is a far higher degree of certainty and promise regarding the company’s outlook. At the same time, analysts use a broad range of assumptions, which may not come true. It is not recommended that investors make investment decisions based on analyst predictions pr price targets alone. Consider a range of factors, including your own personal circumstances and risk profile. Industry conditions are currently buoyant with the ruby market for cut/polished high quality stones reportedly fetching up to US$35,900 per carat. Note, this isn’t the price for the base gem that Mustang sells. Management also indicated it was looking to negotiate strategic sales and marketing agreements prior to the sale of the first Mustang rubies. This could be a potential share price catalyst as it would likely provide a pricing guide, as well as earnings visibility should an offtake agreement be ratified. The security provided by offtake agreements could also positively impact the company’s ability to finance project development.